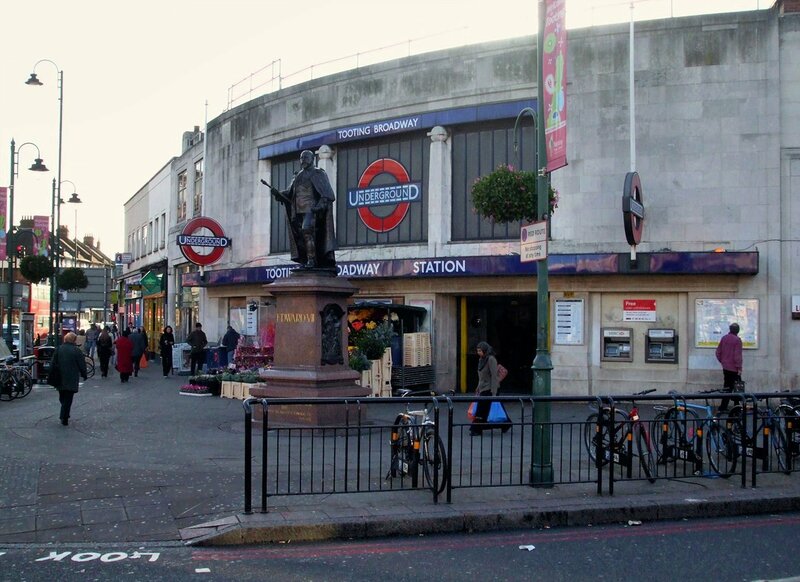 A group of around 20 radical Muslim preachers gathered at Tooting Broadway tube station today to hand out outrageous leaflets trying to convert commuters to Islam. Wearing traditional Islamic clothes and separated into a tent for men and one for women, the group waved NHS style leaflets and preached “Join Islam — Free gas, free water, free electricity”. 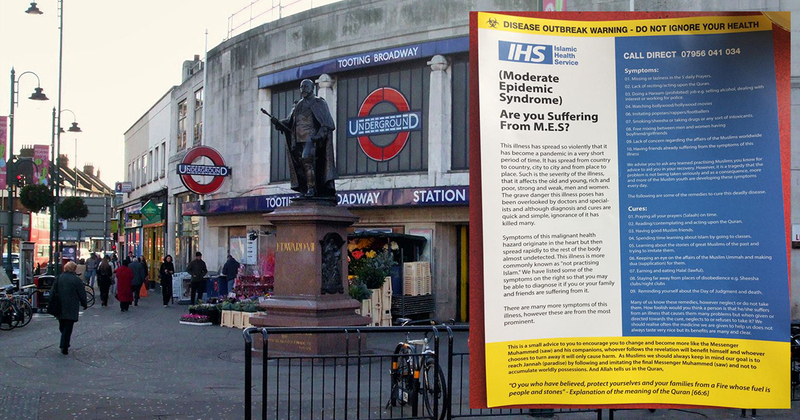 The flyer touted itself as an “Islamic Health Service”, quoting the Quran and warning against a fictional “Moderate Epidemic Syndrome”. 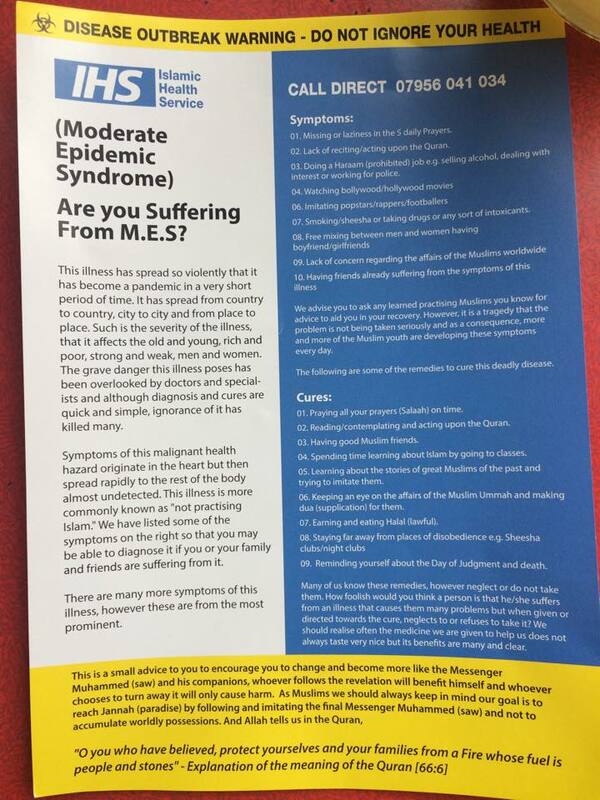 It goes on: “This disease is more commonly known as ‘not practicing Islam'” and outlines “symptoms” such as “watching Hollywood movies” and “imitating popstars/rappers/footballers”. The group also lists smoking, alcohol, drugs and “free mixing between men and women” as symptoms of their disease, the cure for which is “imitating great Muslims of the past” and “reminding yourself about the Day of Judgement and death”. The flyers also display a fake mobile number which cannot be reached for more information. 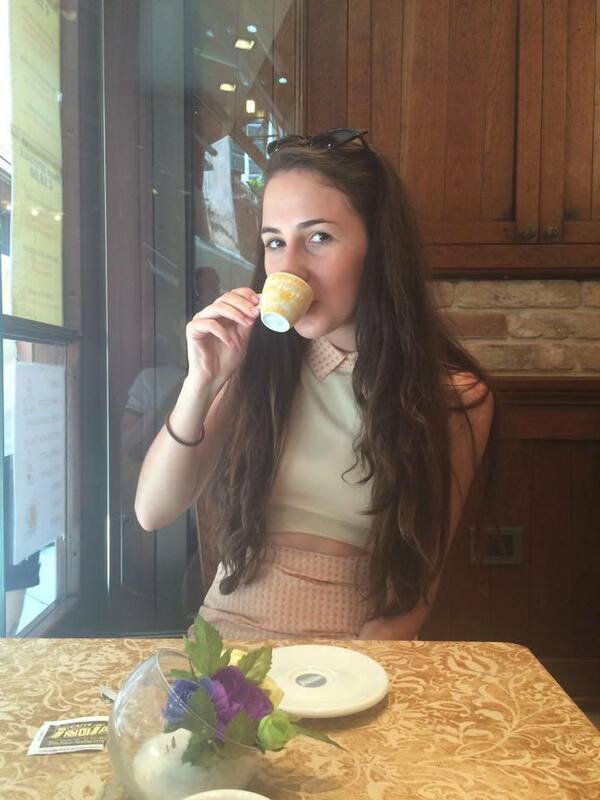 Liverpool second year Katriana Ciccotto was among those who confronted the preachers and was handed a leaflet. She said: “It was like they were selling fruit on a market stall or something, the way they were shouting. “I approached the women’s tent and spoke to them. They gave me about 10 different leaflets on different topics — women, Muslims in Britain, Sharia Law, all sorts. I was so frustrated by it. Half of the gang of 20 separated themselves between the men and women’s stalls, with a smaller aisle of Muslim men handing out leaflets between the stalls. Others branded the protestors as “laughable” and accused them of “stirring up hate” on social media. Pretty sure that the group with 'Islam is Superior' signs at Tooting Broadway station aren't helping anyone. History and Spanish second year Katriana said other commuters challenged the group, asking questions about Islam and Saudi Arabia, while Muslim passers by were shaking hands with the protesters and congratulating them. She added: “I saw a Christian man rejected their ideas by just yelling ‘Jesus’ repeatedly.